According to American Academy of Implant Dentistry, over 30 million American citizens are missing all their teeth in one or both jaws that lead to nearly 15 million residents in the U.S. to undergo bridge and crown replacements and 45 million senior citizens in the U.S. are likely to need one or two dental implants by 2025. The dental implants market is expected to reach USD 6.90 billion by 2025, growing at a CAGR of 7.51% during the forecast period. Technological innovations like CAD, mini dental implants, and 3D laser dentistry, growing concern about oral hygiene and rising demand for cosmetic dentistry are expected to positively reinforce the market. Medical tourism in various countries such as Malaysia, Hungary, Costa Rica, Mexico, Thailand, and India is major trend for the growth of the global dental implants market. However, high cost of treatment, low reimbursement policies, insurance coverage discrepancies and risk of malfunctions are expected to impact the target market negatively. Root form accounted for 67% of total dental implant market share in 2017 and tends to continue its dominance over the forecast period. Endosteal implants dominated in 2017 with more than 78.2% of the total dental implant market revenue-wise and are expected to rise at a significant pace over the forecast period, followed by subperiosteal implants that held 10.1% of market share in 2017. On the other hand, transosteal and intramucosal implants share is expected to further decline over the forthcoming years. Titanium implants dominated the market and accounted for 45% of global market revenue in 2017 owing to its extreme toughness, light weight, high tensile, corrosion resistance, and ability to withstand high temperatures. However, newly introduced concepts in dental implants market is “zirconium”, which tends to acquire the market share of titanium product segment through 2025 coupled with the fastest growing CAGR. Dental clinics acquired the major share of around 65% of overall dental implants market in 2017 and tend to dominate the market in forecast period owing to preference of private clinics among the patients. Europe region dominated the global dental implant market, registering the CAGR of 6.1% over the forecast period and accounted the market share of 32.5% in 2017. North America, driven by the U.S., is the second-leading market for dental implants globally due to increasing geriatric population. Singapore, India, Malaysia, Indonesia, Costa Rica and South Korea are the opportunistic market owing to medical tourism and increased focus on the development of technologically advanced and cost-effective products. The report covers the present ground scenario and the future growth prospects of the facility management market for 2017-2025 along with the market players’ analysis. We calculated the market size and revenue share on the basis of revenue generated from major players worldwide. Dental Implants market is forecasted on the basis of revenue analysis, product benchmarking and strategic developments of key market players. Global Dental Implants Market Outlook 2017-2025, has been prepared based on an in-depth market analysis from industry experts. 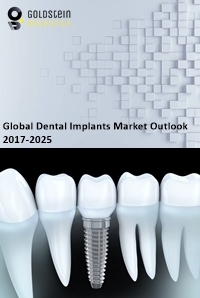 The report covers the competitive landscape and current position of major players in the Dental Implants market space. The report also includes porter’s five force model, SWOT analysis, company profiling, business strategies of market players and their business models. “Global Dental Implants Market Report” also recognizes value chain analysis to understand the cost differentiation, pricing models to provide competitive advantage to the existing and new entry players. Our Global Dental Implants Market Report comprises of the following companies as the key players: Straumann Holding AG, Dentsply Sirona Inc., Henry Schein Inc., Zimmer Biomet Holdings Inc., 3M Health Care, Danaher Corporation, Ivoclar Vivadent AG, AVINENT Implant System, Osstem Implant Co. Ltd., and S.L. Bicon LLC.